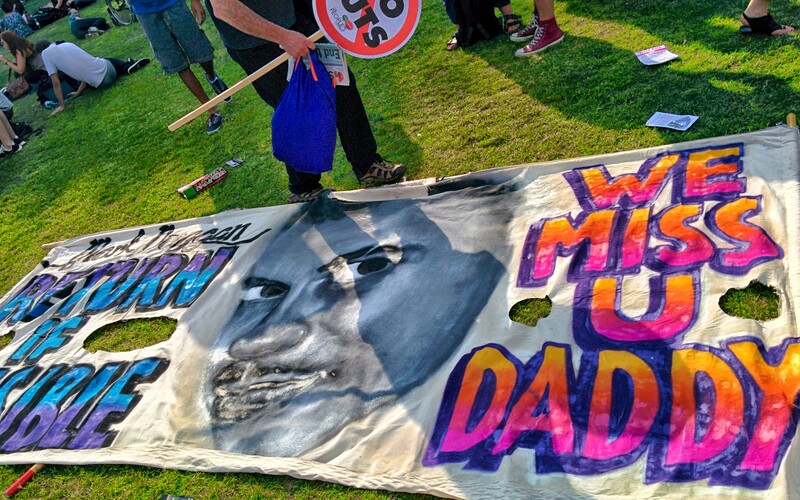 Families of people who have died in police custody will be joining Mark Duggan’s family for a march and vigil in his memory, taking place today on the third anniversary of his shooting by police in Tottenham. “I stand with the Duggan family in remembrance of their loved one, Mark.” said Marcia Rigg, the sister of Sean Rigg who died in a Brixton police station in 2008. “Why? Our questions are the very same even though we had never met before. Unity is the families strength and the trick is to never give up the fight, for how else will justice come?” Others attending include relatives of Cherry Groce, Joy Gardner, Christopher Alder, Roger Sylvester and Leon Patterson. Diane Abbott MP has released a statement in support of the family. Susan Alexander, the mother of Azelle Rodney, has also sent a message of support to the family which will be read out at the vigil. The CPS announced last week it will be prosecuting Officer E7 for Azelle Rodney’s murder. He was killed during a “hard stop” in 2005. Six years later, and despite recommendations by the IPCC to review this “high risk” tactic, Mark Duggan was shot by police in another “hard stop”. The march and vigil follows on from last month’s judicial review at the High Court in which the family have sought to have the Inquest conclusion of “lawful killing” quashed. The result will be know in the autumn (likely September or October). 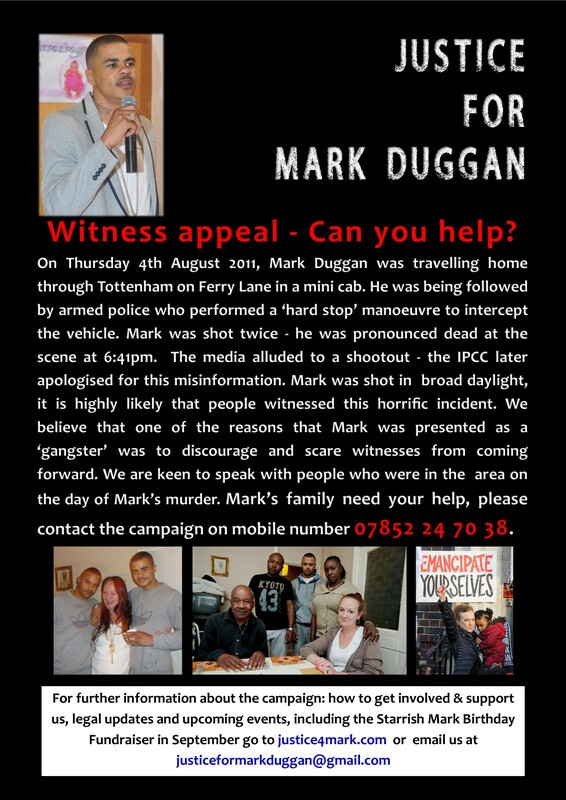 In the meantime the Justice for Mark Duggan family campaign is launching a fresh appeal for witnesses. In a highly critical report following the Inquest, the Coroner Judge Keith Cutler, expressed concern that that “doubts about the accuracy of police accounts are not minimised”. He identified a number of issues including the “scope for conferring” between police, the handling of the crime scene which saw crucial evidence moved, and the failure to record the scene (despite the first aid attempts being filmed by police), which may have helped with “the significant issue of how and when the gun got some distance from Mark’s body”. Judge Cutler also identified the falsehood that Mark had shot at police first (he was in fact unarmed), circulated by a still unidentified source at the IPCC to the media, as contributing the reluctance of witnesses to the shooting to come forward. The only independent witness to the shooting to come forward so far, “Witness B”, described Marks killing as an “execution’. The campaign hopes this fresh witness appeal will encourage people who may witnesses something come forward. Eye witness evidence has been crucial to establishing facts of how people have died in custody or following police contact in many other cases. ► Download the Appeal For Witnesses jpg and the background PDF document. 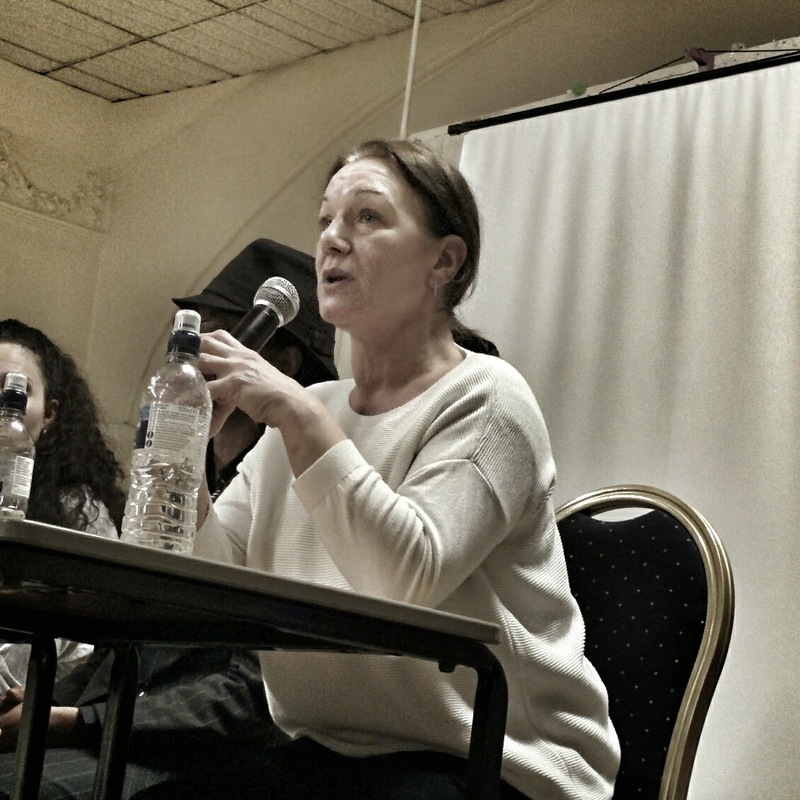 Posted in events, media, press releases, statements and tagged duggan, j4m, justice4mark, press release, statement, witness appeal on 4 August 2014 by bat020.